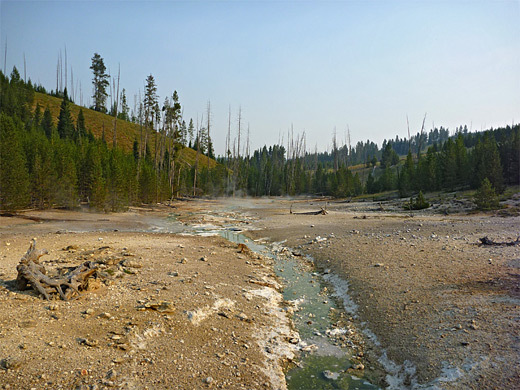 The Solfatara Creek Trail runs for 6.5 miles across Yellowstone's Central Plateau, starting and finishing at trailheads along the Grand Loop Road north of Norris Geyser Basin. The southern two thirds follows the eponymous creek, which is surrounded by low hills and thick, old growth lodgepole pine forest, but most people just hike the northern third, as this encounters more undulating ground with better views, and passes two backcountry thermal areas; Amphitheater Springs and Whiterock Springs, neither containing any particularly impressive features, but both interesting on a small scale, because of the pretty colors and forms of the hot pools, streams, fumaroles and mudpots. One other attraction, a little way off trail, is Lake of the Woods, a sizeable body of water lined by lily pads and long grass. Even the more varied northern section of the trail is lightly traveled, so the path is a good choice for those seeking solitude. Much of the route is quite straight, following an open corridor through the forest beneath some powerlines, and the grassland and meadows along the way allow many species of wildflowers to grow. This region of the park is favorable territory for bears, and their activity sometimes causes the path to be closed in early summer. 22 views along the Solfatara Creek Trail; gallery, slideshow. Amphitheater Springs and Whiterock Springs (mp4; 1:35 min; 43 mb). The south trailhead lies along the side road to Norris Campground, overlooking the junction of Solfatara Creek with the Gibbon River, while the northern end (the hike described below) begins from a pull-out just off the main road, 3/4 mile south of Beaver Lake picnic area; a small parking lot in a clearing in the woodland, shielded from the highway and so also a good picnic spot. Steep, wooded hills rise up to the south and east close to the trailhead, either side of a short ravine, the upper end of which contains the hot pools of Amphitheater Springs, but there is no immediate sign of any thermal activity as the path sets off through a thin strip of woodland and across a small, warm-water stream (Lemonade Creek), which drains in the basin. The stream is bridged by many fallen trees at right angles, this being near the edge of an area burnt in the 1988 wildfires. 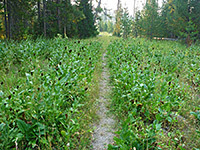 The next section of the trail crosses open, moist woodland with several tall-growing species of wildflowers including western coneflower and common cow parsley, before starting a 400 foot ascent over half a mile, up the east side of the ravine. 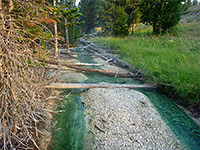 Amphitheater Springs basin lies off trail further up Lemonade Creek, which is now bright green in color due to algae; the thermal area may be reached by continuing along the valley floor just as the path starts to climb, through a thin patch of trees and into a large open area. 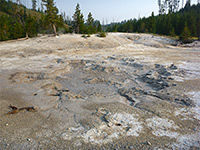 The first active features are small springs producing hot water that flows through channels lined by yellowish sulphur, then beyond are a few bigger pools and mudpots plus many smaller vents and fumaroles. 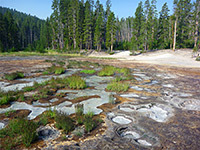 The thermal basin extends about half a mile, but the upper parts are harder to reach due to an intervening belt of closely-spaced, new growth trees. The hills to the west and east are steep and not easily climbable. As it climbs, the trail has good views of Amphitheater Springs, over the wooded hills at either side and across to the high summits of Mount Holmes and adjacent mountains. The route crosses an open section of the hillside, close to a dormant thermal stream, then enters low, new growth forest, winding up the side of a little valley to a pass in the hills, where the trail joins some power lines, following a cleared corridor southwards. The land climbs to a high point, drops down a little, rises again staying fairly level for a longer distance, before a steeper descent into a circular meadow; around here the views become more extensive to the south. 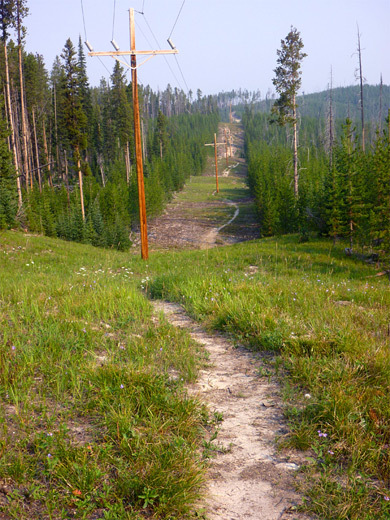 Towards the first part of a power lines the path crosses two small gullies which slope eastwards towards Lake of the Woods, which is not visible from the path though reachable by a few minutes off trail hiking. The trail continues across the flat, grassy meadow, and back into woodland, where it moves away from the powerlines and instead runs close to a tiny stream, a tributary of Solfatara Creek which originates from Lake of the Woods. A patch of white earth in a clearing in the forest marks the site of another dormant thermal area, accompanied by a faint, residual smell of sulphur, then a short distance beyond is the fully active Whiterock Springs, most of which lies on the west side of the trail. There is much obsidian on the path hereabouts, and also a good selection of wildflowers. The springs consist of many small vents and pools, with just one larger feature. 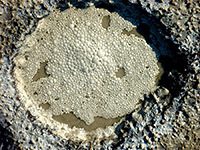 All are surrounded by soft, clayish earth, and an unpleasant smell permeates the area, a toxic mixture of carbon dioxide and hydrogen sulphide. 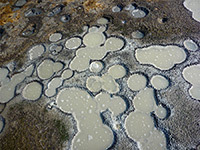 The pools are ringed by colorful encrustations and for the most part bubble quite gently, due to the carbon dioxide; some contain cold water but still effervesce. A non-thermal creek enters the basin from the west, while the exit stream flows east, soon joining Solfatara Creek. Beyond Whiterock Springs, the trail, now even less traveled, enters a bigger treeless area and follows a narrowing grassy corridor southwards alongside the creek, past several other tributaries, before turning southwest down an overgrown valley, out to more grasslands beside Norris Campground.